Labec offer two models for the C02 Incubator Air-Jacketed with Direct Heat. The HF90 and HF240 are equipped with 90°C Moist Heat Disinfection System. All accessories and parts inside the chamber such as C02 sensors, fans and shelves are disinfected effectively. Mycoplasma is 100% eliminated in a routine disinfection circle. 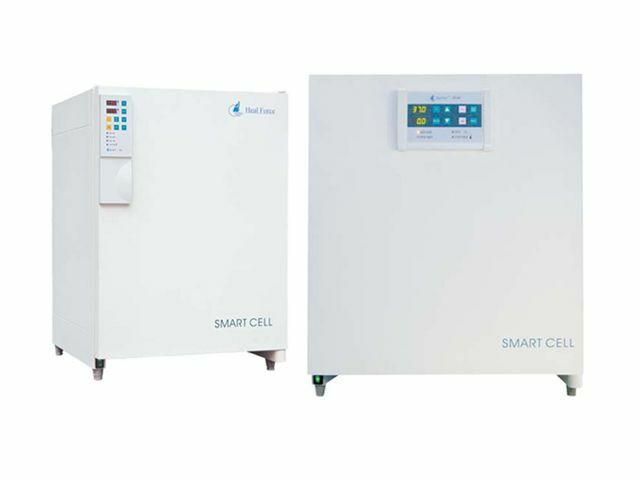 With a programmable C02 sensor “AUTO-START”, Easy to clean structure design and a Inlet filter for C02 supply makes this an exceptional performing C02 Incubator. Labec offer two models for the C02 Incubator UV Air-Jacketed with Direct Heat. The HF151UV and HF212UV are equipped with a long-life ultraviolet lamp at the inner back of the chamber to eliminate contaminant. To take maximum effect of disinfection, the wavelength of UV light is maintained at 254mm. With a programmable C02 sensor “AUTO-START”, Easy to clean structure design and a Inlet filter for C02 supply makes this an exceptional performing C02 UV Incubator. Labec offer the HF160W Water-Jacketed Incubator with a HEPA filter for Disinfection. Applying the Water-Jacketed system, the temperature is more stable and insusceptible in accidents like power supply cut off. The HEPA filter is very efficient to prevent particulates larger than 0.3μm at 99.97%. The filter system filter runs continuously and within every 60 seconds, the volume of the entire chamber is disinfected. With help of HEPA filter, the air quality reached Class 100. The HF160W is also equipped with a patented airflow system, which ensures the temperature and C02 concentration to be stable and uniform all over the chamber.